L.A. County firefighters extinguished a fire in a garage on Atwood Boulevard in Newhall in about 15 minutes on Sunday afternoon. Firefighters and deputies from the Santa Clarita Valley Sheriff’s Station responded to reports of a house on fire at 25039 Atwood Boulevard shortly after 1 p.m.
“L.A. County Fire units were dispatched at 13:06 and on scene at 13:10,” County Fire Inspector Sal Alvarado said. Upon arrival, firefighters found a garage on fire, threatening an attached house. After an intensive 15-minute attack, the fire was called out at 13:26, Alvarado said. No injuries were reported, and the cause of the blaze remains under investigation, Alvarado said. 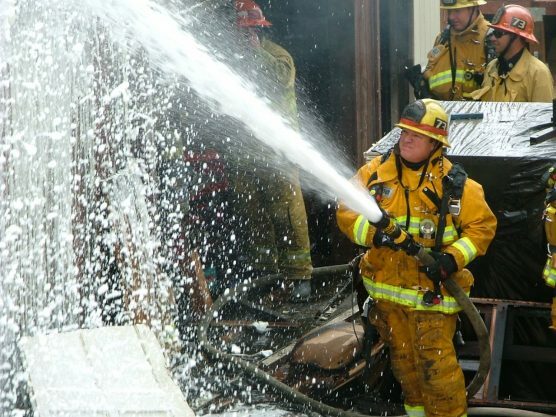 L.A. County firefighters extinguished a garage fire in Newhall Sunday in about 15 minutes. | Photo: Kevin Gilley/two8nine media.